Be our guest! 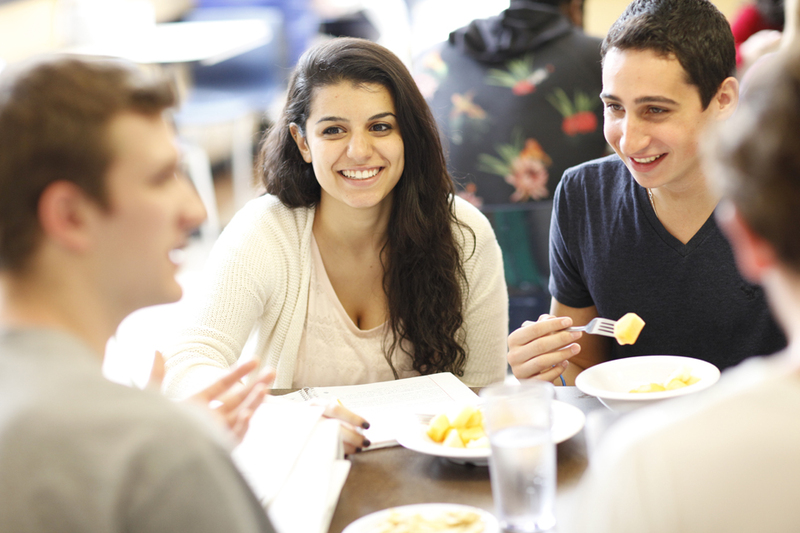 Beginning a new chapter of your life at Brandeis means new friends and new food. As you begin to develop a routine as a college student, there is plenty of help along the way. First-year students who arrive in August are assigned to double or lofted triple rooms in one of two residence quadrangles (quads), Massell Quad or North Quad. Midyear arrival students will be assigned either a single or double room in Village with other Midyear students. Residents will be greeted by their Community Advisors (CA), students who live in the residence halls and serve as mentors, leaders and resources throughout the school year. CAs can assist you with getting around campus, solving roommate conflicts, handling homesickness and other personal concerns. In addition, there is a CA on duty in each quad every night in case of emergencies. You will live with your roommate(s) for at least one semester, so it’s important for all roommates to understand one another’s lifestyle. Your CA will meet with you and your roommate(s) at the start of the semester to complete a roommate agreement, which will allow you to establish the ground rules for your room and for living together. We recommend contacting your roommate before school begins to get to know each other and discuss if you would like to bring shared refrigerators, microwaves or televisions for your room. Off-campus Student Lounge: The off-campus student lounge is in the Shapiro Campus Center, providing Brandeis off-campus residents with a place on campus to hang out during downtime. The lounge serves as a quiet space where you can retreat, rest, and re-energize for the remainder of the day. Off-campus Student Lockers: Off-campus residents may keep their books and personal belongings in a locker provided by the university. Lockers are dispersed on the second and third floors of the Shapiro Campus Center. For information and access to the lounge and lockers, inquire at the information booth in the atrium of the Shapiro Campus Center or the Department of Student Activities, located in suite 201 of the Shapiro Campus Center. Dining Services offers a variety of different meal plans for students to suit every appetite. Brandeis Dining has it all, from all-you-care-to-eat options in Sherman and Lower Usdan, caffeine fixes at Starbucks (in the library!) and Einstein's Bagels, or even our own Kosher deli, there is always something new to try. If you have dietary restrictions or other information you would like to disclose to improve your Orientation experience, please contact the Director of Orientation Jenny Abdou at jabdou@brandeis.edu.